Perhaps the approach of your new national coach, Bill Sweetenham, from Australia, will change all this. Australia’s loss, Britain’s gain!! Bill Sweetenham is due to take over from Deryk Snelling as ASA National Performance director on November 1st. He was one of the founding coaches of the Australian Institute of Sport swimming programme in 1981, when he became the head coach of the men’s programme. He coached at the AIS for ten years and was the National Head Coach in Hong Kong for 4 years before taking up his current position as Head Coach of the Australian Junior Team. During his career, Bill has coached Olympic Gold Medallists, World Champions, World Record Holders, and Commonwealth Games and Pan Pacific Gold Medallists in various events. Two of his former swimmers, Michelle Pearson (Australian 200 freestyle national record) and Tracey Wickham (ex world 400 and 800) held the longest standing records in Australia. He has a clear philosophy on he development of junior swimmers into senior internationals and has been running a programme to identify and help talented teenagers, through a series of training camps for swimmers and coaches. This is particularly relevant to his new post as the ASA has recently announced plans to fund up and coming juniors to aid them in their swimming development. 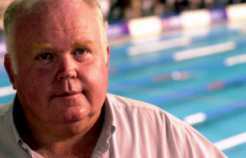 He has a confirmed belief in exposing swimmers to the pressures of international competition whenever possible. Of his Australian Juniors he says “They’ve learned how to cope with problems, they’ve learned self-management skills, they’ve learned all the skills that are essential to competing successfully in the Olympic Games. Assuming that most swimmers are only going to make one Olympics, hopefully two, they don’t want to use the Olympics as a learning experience. They will need to have the skills to capitalize on the opportunity first time out.” An interesting perspective and one that is at odds with some British swimmer comments about Sydney being their first Olympics. In summary, there is no doubting Bill’s credentials and pedigree as an international coach. We can only hope that he is given the support of the ASA and the swimming community at large to enable him to carry out the daunting task of turning Britain into a force in world swimming. This will not be an overnight task, and a huge medal haul in Athens in 2004 might be too much to hope for, but in the long term, with his proven track record in turning promising juniors into good seniors Bill Sweetenham can only be a good thing for British swimming.